We specialize in kamigata-e, original eighteenth to twentieth century Japanese woodblock prints from Osaka and the surrounding region. 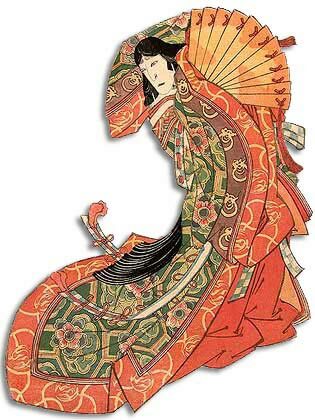 We also offer occasional nineteenth-century Edo prints and twentieth-century art works from Osaka, Tokyo, and other regions of the world. Our inventory is comprehensive and always changing, with a broad range of artists and prices. Gallery: Our Sales Gallery is arranged by artist. Each print is accompanied by a full description. Articles and More: We offer Articles on topics related to Osaka prints, many covering aspects of Japanese printmaking that have been overlooked in the standard literature. Various essays on a variety of other topics can be found at Varia. We also maintain an Archive of the information pages for all sold prints. An extensive Glossary, artists' Biographies & Signatures, and detailed Bibliography serve as additional resources. A recent addition to our site is a Video presentation offering an introductory overview of kamigata-e. Contacts: You may write to us or E-mail us with your questions or requests to purchase Osaka prints, drawings, and paintings — see Contact Us and Conditions of Sale. Links: Here we recommend Other Websites with information and images related to Osaka prints. Search: Provides text/keyword and image searches. See the Search Page. We are proud to announce the spring 2019 update for our osakaprints.com website. On offer once again are superlative examples from across the decades of Kamigata print-making history, including rarely encountered works by masters like Hokushu, Yoshikuni, Hokuei, Sadamasu and Enjaku. Also not to be overlooked is the stunning six-sheet Yoshitaki and the dynamic design by Toshimoto commemorating the 1877 civil war. The past several updates have included, despite our website's name, various shin hanga and sosaku hanga 20th century works. This was primarily due to fluctuations in the availability of top-quality Osaka prints for filling an update. Now, however, still keeping Kamigata prints as our chief focus, we have decided to increase the number of more contemporary works. The 20th-century component this time is rather striking, in that it includes truly seminal works by Hasui, Shôson and Yoshikawa Kampo (from the world of shin hanga) as well as a major early piece by Azechi Umetarô, plus images by Kawanishi Hide, Hiratsuka, Mizufune Rokushu and Yoshitoshi Mori, representing the sôsaku hanga tradition. An exemplary work by Paul Binnie combines the do-it-all approach of sôsaku hanga with the style of shin hanga. We hope you enjoy the varied cavalcade of this update. Mailing List: If you would like to be informed directly about our updates, please contact us at Osaka Prints Update.